I can’t believe it’s been almost a year since I signed up for this race, and it finally happened this past weekend! Last September, I decided to sign up for Timberman Ironman 70.3 at Lake Winnipesaukee in New Hampshire as my goal race for 2012. At this point, I didn’t even have a bike, and I had been back in the pool for only a couple of weeks! Going back a little bit… I came off one of my highest mileage weeks into a 2 week taper for the race. Last Sunday, I ran the Falmouth Road Race. It wasn’t my best race, but I knew I was in the middle of taper and my body wasn’t quite ready to peak. And that was ok, since Timberman was my goal race! I spent last week relaxing on the Cape with my family – getting 10+ hours of sleep each night, eating good food, and doing some light workouts to keep my body moving. I got to New Hampshire on Friday, and went to the expo and bike check-in on Saturday. You have to check your bike into transition the day before the race. It felt weird to leave my bike there, but it was nice not to have to worry about it on race morning. Getting to the transition area, which is right off the beach of Lake Winnipesaukee, got me very excited for the race! Saturday night, my sister and her boyfriend came up from Boston and we had dinner with friends from CRC – another Timberman racer and her husband. Sunday was race day! It started with an early wake up call at 4am, and breakfast at the hotel. 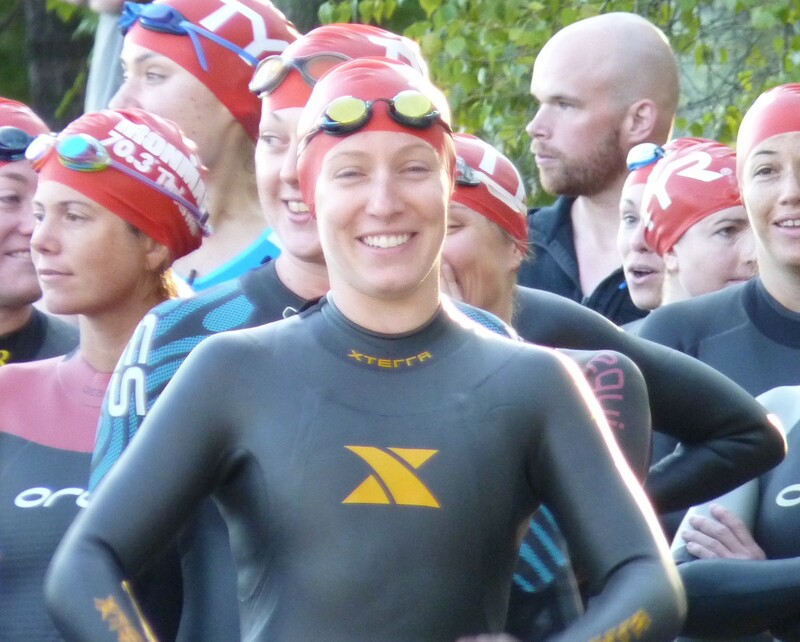 We got to the transition area around 5:30am – got our bodies marked, got our gear set up in transition, waited in line for the porta potty’s – and then it was almost time to get out of transition and in line for the swim start! The weather was perfect – cool and sunny in the morning, and got into the 70’s during the warmer part of the day – a much appreciated cool and dry day compared to the heat and humidity we’ve had recently! In line to start the race! I was in the 6th wave for the swim start, for the 25-29 and 35-39 age groups. It was a wetsuit legal swim, with water temps around 72 degrees. At 7:20am, we lined up in the water, and we were off! I had a good position in the water, and was able to take an early lead. The water was shallow for a while, so I did a couple dolphin dives off the bottom of the lake before I started really swimming. The swim course was really well marked with large yellow and red buoys that were easy to spot. The first 200m or so felt tough. I hadn’t quite warmed up yet and my breathing was still heavy and not consistent. Eventually, I found my stroke and breathing pattern and began to feel much stronger in the water. At this point, I was catching up to the waves ahead of me, and it was difficult to navigate around the other swimmers at times. But luckily, the water was calm and the caps were bright (compared to my last triathlon where the wave in front of us had dark green caps that were so hard to see!). Final swim time: 28:54 (1:29 / 100m). In my last two triathlons, when I came out of the water I was disoriented and dizzy from going from the horizontal (swimming) to vertical (running) position. I felt good coming out of the water during this race though! I got my cap and goggles off, pulled down the top of my wet suit and got ready for the “strippers”. At the bigger triathlons (and maybe all the Ironman race series? ), they have wetsuit strippers that help you get out of your wetsuit in transition. You basically unzip and get your arms out, lay on a mat, and they pull off the rest of your wetsuit. This is pretty awesome, because it can be really hard to get your legs out of your wetsuit! Onto the bike! This was the part I was most nervous about. 2 weeks ago, I biked the course to get familiar with the roads. I knew there were a couple tough hills and some patches of rough road. I was also nervous about pacing – I wanted to ride strong, but I didn’t want to sacrifice a good finishing run if I went too hard. The first few miles went fine. My legs felt good from the start, which was a surprise because it usually takes me 5-10 miles to start feeling good. The first big hill at mile 9-10 was not too bad. I tend to do well on the climbs, so I passed a number of people. As we hit the highway, I started to get into a good groove. I tried to stay in my own race and not worry about passing or getting passed. I think I might have gone out a little hard on the first half, because the second half felt much harder! I had been worried about fueling enough during this long of a race, but I managed to eat a Powerbar and pack of Shot Bloks during the ride, as well as drinking a bottle of gatorade and another of water. When I got to the last 10 miles of the ride, I was ready to get off the bike! But at this point I was getting a little nervous for the run because my legs were feeling a bit heavy and shaky. I tried to keep it smooth and under control for the final stretch back into the park. Final bike time: 2:49:51 (19.78 mph). Back into transition, and into my running shoes… my legs surprisingly felt ok coming off the bike! Of course they felt a bit heavy, but not much different than when I did the Olympic distance tri last month. I knew my running training and racing had been going well so far this year, so I felt confident that I could have a strong run. It was starting to get warm at this point, but there were aid stations at every mile with cold water, gatorade, and sponges. I squeezed a sponge over my head at each, and drank mostly water because it was really cold and refreshing. I also ate a few more Shot Bloks during the first half of the race to ensure I could have enough energy to finish. The run was an out and back, 2 loop course, that was pretty hilly! Though the 2 loops was a bit hard mentally, it was fun to run back through the transition area when tons of people were cheering. It really helped me get going again for the start of the second loop. Running down the home stretch! Although I slowed down a bit on the second half, I felt fairly strong throughout the run. The last two miles were particularly tough, but that is to be expected. When I finally got to the home stretch, I was so happy that I had finished my first half ironman, and met my goal time of sub-5 hours! Final run time: 1:32:25 (7:03/mile). Overall race time: 4:57:05! I met my goals for the swim and the bike, and was just short of my run goal (was aiming for sub 1:30). I also finished 1st in my age group (25-29)! I took home an engraved bottle of NH maple syrup. I also qualified for the 70.3 National Championship in Las Vegas next year. Though the opportunity sounds awesome, I wasn’t quite ready to commit to it right now, so I declined and passed it along to the next finisher in my age group. Post-race with my favorite cheerleaders! I really enjoyed this race, and can’t wait to do more 70.3’s in the future! Special thanks to my sister J, who woke up early on her birthday to cheer me on! Amazing job! So proud of you! You ROCKED it!! Can’t wait to run with you when I get home! Thanks, Anne! Hope you are having a great time in Switzerland!